1. What better way to liven up Canada's coldest season than to host a big celebration? The tradition of winter festivals dates back to the 17th-century, but the first organized carnivals in modern times occurred 125 years ago in Québec City, setting the blueprint for more than a century of frosty fun. The Québec Winter Carnival, which became an annual tradition starting in 1954, is also the oldest of the festivals held across Canada. Frank Carrel, proprietor and managing editor of the Québec Daily Telegraph, devised the Carnival as a way to raise spirits during the winter season. Erecting an ice palace in front of the Parliament building, it also featured a parade, concerts, sporting competitions, and a number of other activities across the city. 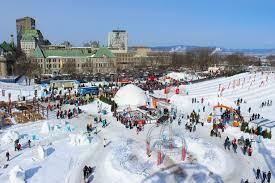 Have you ever been to Québec City to visit, especially during the Winter Carnival? 2. 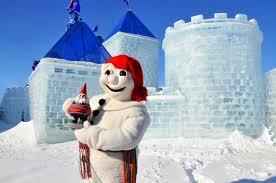 This weekend, the Québec Winter Carnival kicks off and children and adults alike can be seen enjoying the snowy celebrations while paying homage to their favourite snowman, the official representative of the carnival, Bonhomme, a large snowman who always wears a red cap, black buttons, and a ceinture fléchée, or "arrowed sash." He lords over his own ice palace and leads a night parade along Grande Allée, which is decorated with lights and ice sculptures. —a scene depicted in today's Doodle by Canadian-born guest artist Randeep Katari. Other festivities include the annual ice canoe race on the St. Lawrence River, axe throwing, and—for the truly intrepid—the Snow Bath, a rare convergence of snowdrifts and swimming trunks. 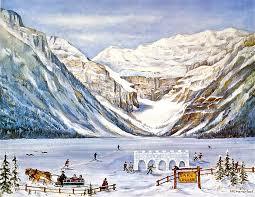 Are you someone who enjoys all that winter has to offer, or prefer to hide away in your house, nice and warm? 3. While one of the best, the Carnival in Québec is not the only wonderful winter carnival to enjoy in Canada or the U.S. Have you attended any of these carnivals or festivals?